Birmingham: Printed by and for Pearson and Rollason, 1781. First edition. 8vo. (8.75 x 5.5 inches). pp.2 [blanks] + xii + 10 [unpaginated list of subscribers] + 280 + 2 [blanks]. Three extra leaves numbered 7*- 8*, 179* - 180*, and 233* - 234* inserted into the numbered sequence. Folding engraved frontispiece. Two folding maps. Fourteen hors-texte plates, one of them fold-out. List of Subscribers. 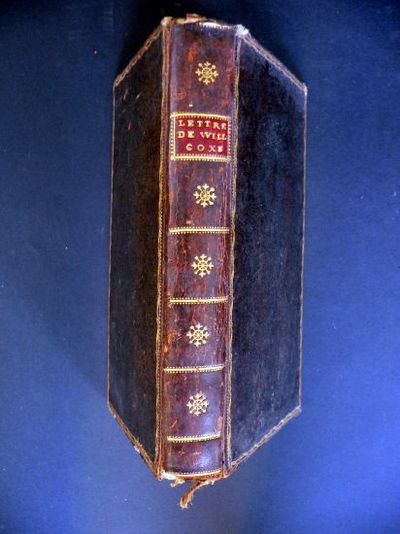 Recently rebound in a simple brown cloth, gilt to spine. Signature of William Hunt to the fly leaf [Hunt was one of the subscribers]. Beneath, signed 'George Hunt, from Uncle James, 22nd September 1856'. The fourth plate has a one-inch vertical fold to the fore-edge. The fourth and final flap of the second fold-out map is detached along the fold, but is present and not torn. Occasional light foxing. A very good copy. We reduce the default shipping charge for lighter books or use it for a tracked service if books are expensive or uncommon. We pack books securely in boxes, or corrugated card or cardboard, and protect corners with bubble-wrap. Salisbury: E. Easton, 1781. Second Edition. Hardcover. Very good +. Samuel Hieronymus Grimm. Contemporary brown calf. Five raised bands with gilt tooling, title and date. Boards with gilt lines at edges, blind stamped decorations adjacent to lines and blind crosshatching within. Expert repairs to joints. Edges marbled. Ruffling and short tears to the margins of the first plate and title page, each of which extended beyond the text block. 16 b/w plates, some missing tissue guards. 4to. 214 ps. Errata. Bookplate of Douglas Fairbanks Jr. on paste down end paper. Signed and dated (1781) on half title page by illustrator S.H. Grimm. Signed on title page by presumed first owner Andrew Gother. Reverend Gother was the rector of Shorwell on the Isle of Wright, who drowned off the coast of southwest Africa on his way to start service as a missionary. Staten Island, 1781. 1 page. 1 vols. Folio. Integral leaf present but torn along bottom edge, small stains here and there. 1 page. 1 vols. Folio. Eighteenth Century Staten Island Document. 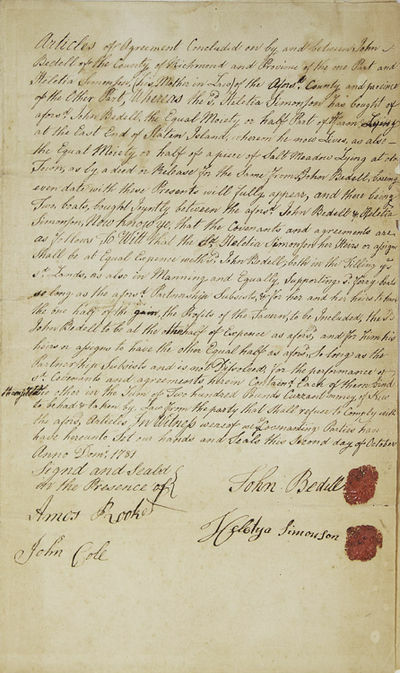 Contract to share profits and expenses on jointly held property including "the Farm lying at the East End of Staten Island...the Sale Meadow Lying at old Town...and two boats bought joytly betwee" them. The agreement stipulates that they share the expense of "Tilling the said lands, as also in the Manning and Equally Supporting said ferry boats..." and sharing the "Profits of the Tavern". Unusual piece of Staten Island history, in the midst of the American Revolution. Lichfield, 1781. Quarto. Modern paneled calf, boards and spine gilt, leather labels. Extremities lightly rubbed, boards lightly scuffed. Bright and clean internally. Very good. An extra-illustrated copy of the second edition, after the first of the same year, of this tribute to the unfortunate André. This edition includes verses "To Miss Seward" by W. Hayley. The added plates include portraits of the principal players in the story, including Major André, George Washington, Benedict Arnold, and the author, as well as a print of the capture of André and of the elaborate funeral monument. Also tipped in is a copy of the satirical cartoon, "The Loss of Eden and Eden Lost," published in London in 1785, which mocks the easy treachery of Benedict Arnold. Voyage dans les mers de l?Inde, fait par Ordre du Roi, A l?occasion du passage de Vénus fur le disque du soleil le 6 juin 1761, & le 3 du même mois 1769. Par M. Le Gentil, de l?Academie royale des Sciences. Tome Troisième. (3 seul). Abhandlungen zur Naturgeschichte, Chemie, Anatomie, Medicin und Physik, aus den Schriften des Instituts der Künste und Wissenschaften zu Bologna. 2 in einem Band. Odyssee. Übersetzt von J. H. Voss. München, Bremer Presse 1926. 4to. 382 S. Handgebundener roter Orig.-Maroquinbd. auf 5 Bünden, Kastenvergoldung, Rückentitel, Deckelfileten u. Vollgoldschnitt. (Signiert Frieda Thiersch). Philadelphia, 1781. 12mo. Printed self-wrappers, stitched. Additional stab holes in blank gutter. Toning, light soiling, and scattered foxing. Else very good. 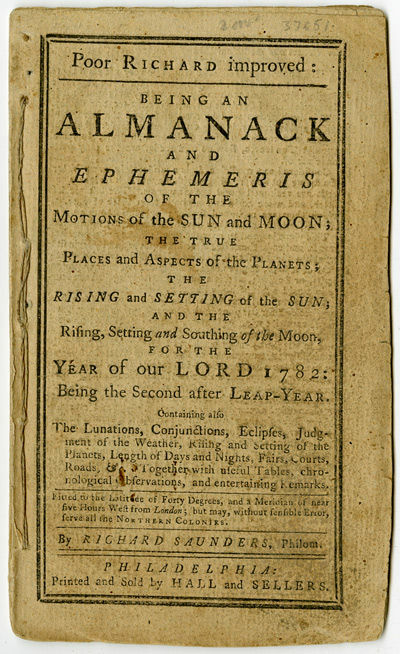 Revolutionary War-era Poor Richard's almanac, containing a list of "Remarkable Occurrences" relating to the war, together with an article on the "Medicinal Uses of Tansey and Camomile, recommended by Dr. Cook, and various aphorisms and tales. Woodcuts illustrating the different signs of the zodiac accompany each month of the almanac. The illustration, "The Anatomy of Man's Body, as govern'd by the Twelve Constellations," appears on page . La Tentation de S. Antoine, Ornée de Figures et de Musique. London, 1781. Quarto. Contemporary mottled calf, neatly rebacked with the original spine laid down. Good. A strange ensemble, but the two articles in the collection of the greatest interest are "The Possibility of approaching the North Pole discussed" and "Journal of a Voyage in 1775. To explore the coast of America, Northward of California." This section, consisting of some ninety pages, was written by Don Francisco de la Bodega and is illustrated by a map of the Pacific Coast of America from Baja to Alaska, with capes named by Bodega marked. Wagner comments at length on the origins of this often inaccurate map. Much of the first article was drawn from information provided by whaling captains. There are several pieces on natural historical subjects, as well as "Ohthere's 'Voyage, and the Geography of the Ninth Century illustrated.'" In addition there is an account, illustrated with an engraved portrait, of "a very remarkable young musician" (i.e. Johannes Chrysostomus Wolfgangus Mozart). Oeuvres Completes de M. Helvetius: Nouvelle Edition, Corrigeé & Augmenteé sur les Manuscrits de l'Auteur, avec sa Vie & son Portrait en cinq (5) volumes. New York, 1781. 16mo. Contemporary red morocco wallet binding with engraved silver locking clasp. Interleaved with 19th- century manuscript notes and family records of the Rev. James Armstrong and descendants; additional 19th-century manuscript notes in pockets of binding. Binding lightly worn, else fine. A fine copy of a scarce Hugh Gaine Loyalist imprint, for which only three copies are recorded between Drake and NAIP. 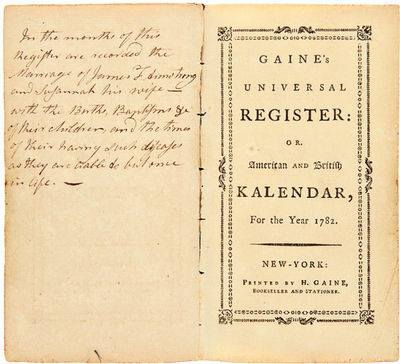 The KALENDAR includes the usual almanac fare together with lists of British officials in America, former royal governors, British and Hessian army officers, and American Loyalist officers. this includes a detailed listing of the English order of battle in North America as of the end of 1781. The extensive genealogical and historical notes and records inscribed in the interleaves of the volume and contained in the pockets of the binding refer to Rev. John F. Armstrong (1750-1816) and his family. Armstrong (1750-1816) graduated from the College of New Jersey (Princeton) and studied theology with John Witherspoon, who granted Armstrong his license to preach (an event the present notes mention as being delayed by the British invasion of New Jersey), officiated at his wedding, and baptized his children. Armstrong served as chaplain during most of the Revolutionary War and later as pastor of the Presbyterian church in Trenton until his death. The notes include records of births, marriages, and deaths for several later generations of Armstrong's family, ending in 1882, as well as records of slaves and diseases and inoculations. An eighteenth century &#145;Market Book' kept by John William Payne, a seller of hides and skins, recording his customers and sales at various local markets, and covering the period November 24th 1781 to October 1st 1783. The blessings of polygamy displayed in an affectionate address to the Rev. Martin Madan; occasioned by his late work, entitled Thelyphthora, or, A treatise on female ruin. / By Richard Hill, esq. Essai sur la physiognomie, destiné A faire Connoìtre l'Homme & à le faire Aimer. Par Jean Gaspard Lavater, citoyen de Zurich et Ministre du St. Evangile. Première - quatrième Partie. (Motto:) Dieu créa l'Homme à son Image. Dissertatio entomologica novas Insectorum species, cujus partem primam (-sextam; all published!) . publice ventilandam exhibent . London, 1781. Antique-style three-quarter calf and marbled boards, leather label. Maps backed with linen. Internally clean. Very good. 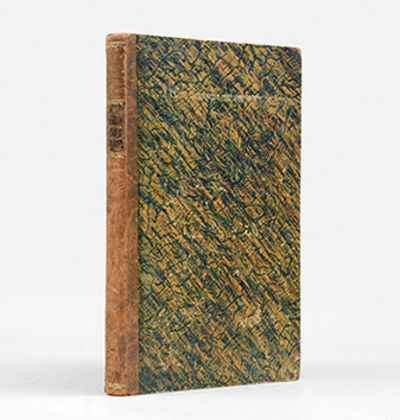 A classic of American travel, in the third and best edition, with expanded text, a biographical sketch of the author, an index, and the added plate of the tobacco plant not found in the first two editions. Carver travelled farther west than any Englishman before the Revolution, going as far as the Dakotas, exploring the headwaters of the Mississippi, and passing over the Great Lakes. The text contains the first published mention of the word "Oregon." 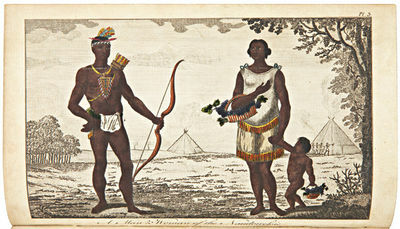 The author comments on the Indians he encountered, as well as offering observations on natural history. The tobacco plant plate is handsomely colored. An important source book and stimulus for later explorers, especially Mackenzie and Lewis and Clark. This is the second issue, according to Howes, with the index. [Madrid, 1781. Small quarto. Dbd. Faint spotting on the first leaf, else clean and bright. Very good. In a cloth clamshell box, morocco label. An important document of the American Revolution in the South, with important ramifications for the history of Florida. In 1779, Spain joined France in aiding the Americans against the British in the Revolution; however, Spanish goals were mainly self-serving, and she particularly wished to regain Florida, lost to Britain in the Peace of 1763 which concluded the French and Indian War. With this in mind, the energetic Viceroy Bernardo de Galvez organized an expedition from Havana against the British base at Pensacola, the capital of the Province of West Florida (including the present Florida panhandle, southern Alabama and Mississippi, and Louisiana as far as the Mississippi River). The expedition set out in November 1780, but was scattered by storms and was launched again in February 1781. The Spanish secured Baton Rouge, Natchez, and Mobile before turning on Pensacola. Despite difficulty in coordination (the Spanish admiral was not under Galvez' direct command and at first refused to run the bar at Pensacola under the British guns), Galvez was able to land his forces and effect a siege, resulting in British capitulation on May 9, 1781. The loss was a major setback to the British in the South and insured that the Floridas were returned to the Spanish in the Peace of 1783. Spanish control of the Floridas was a thorn in the side of the United States until they were sold to the U.S. under the conditions of the Adams-Onìs Treaty of 1819. This account is Galvez' detailed report of the entire expedition, with the last part dated at Pensacola on May 12, 1781. Also included is the treaty of capitulation and a schedule of troops involved. 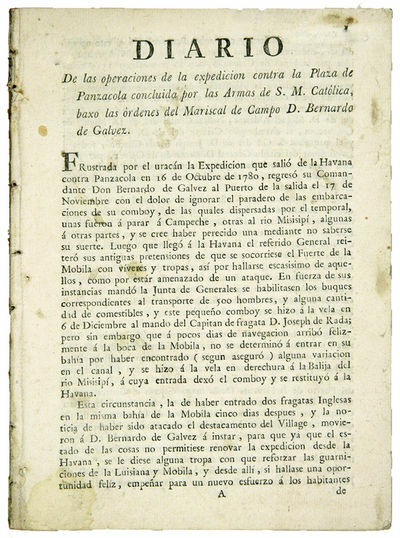 Medina believed this pamphlet was published first in Havana and later in Madrid. We have compared two copies which we believe confirms this. While the same in pagination, and indeed with the same text per page, the line settings within each page vary considerably. One is crudely printed and looks like Spanish colonial printing; the other, with a different type face, is much more elegantly printed. The present copy matches the latter description, which we believe to be the Madrid printing. The easy way to tell the two apart is the first (of many) different paragraph settings: on page 3 the first paragraph at the top has five lines in the Havana edition and only four in the Madrid edition. Accompanied by a copy of Jose Porrua Turanzas' (editor) DIARIO DE LAS OPERACIONES CONTRA LA PLAZA DE PANZACOLA 1781... (Madrid, 1959). London, 1781. Etching with roulette work, with added hand color. Printed on two joined sheets. On laid paper with "J Bates" watermark and "JB" countermark. Fine. 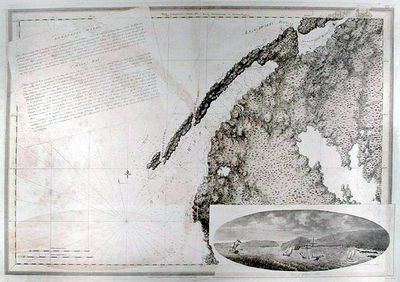 A print from THE ATLANTIC NEPTUNE which charts the Annapolis Royal, with a coastal view of Gulliver's Hole and a descriptive text. THE ATLANTIC NEPTUNE was the first great marine atlas, and one of the greatest achievements of 18th-century cartography. Published in England in 1774, it contains over 250 charts and views of the North American and Canadian coasts. The charts are intensely detailed and contain both hydrographical and topographical details. The ...NEPTUNE was compiled and published for the Royal Navy by Joseph F.W. Des Barres, a Swiss cartographer who joined the Royal American Regiment as a surveyor. Des Barres fought in the French and Indian wars and was enlisted to survey the Canadian coastline. While his fellow surveyor, Samuel Holland, charted the New England coast, Des Barres mapped the shoreline of Nova Scotia, Newfoundland, and the St. Lawrence River regions. In 1774, Des Barres returned to England where he compiled and published his monumental atlas. His dedication to the project was so strong that he published an updated version of the work every year until 1784. Des Barres' work was so superior to any other contemporary atlas that the maps were used as the standard charts of the East Coast for over fifty years. The ...NEPTUNE remains one of the most important atlases ever printed. Its views and maps chart the history of North America and allow us to glimpse a forgotten land long changed by the passage of time. This chart is an excellent 18th-century record of the first settlement in Canada. In 1605, two years before the first permanent British settlement at Jamestown, three years before the founding of Quebec, and fifteen years before the Pilgrims landed at Plymouth, a small party of French explorers, led by Sieur de Monts, established Port Royal as the first settlement in Canada. The settlement was later renamed Annapolis Royal, which is the name assigned to it in Des Barres' chart. The World in three Sections describing the Polar Regions to the Tropics with all the Tracts of Lord Mulgrave and Captain Cook towards the North and South Poles and the Torrid Zone or Tropical Regions with the New Discoveries in the South Sea. - J. Cary sculp. - Published Sept. 29, 1781; by I. Fielding No. 23, Paternoster Row.':. Paris, 1781. 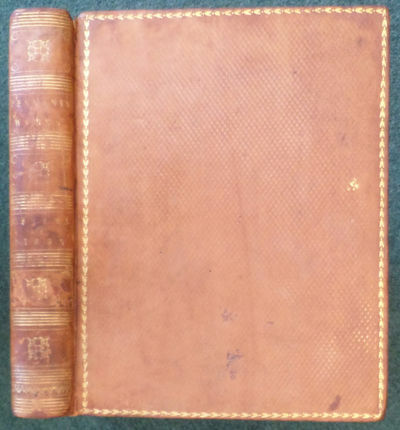 Contemporary mottled French calf, neatly rebacked in matching style, gilt extra, leather spine labels stamped in gilt. A bit of light scattered foxing, but generally quite clean internally. A handsome set. An absolutely phenomenal association copy of this influential study of the antiquities of the Italian city of Herculaneum, destroyed during an explosion of Mount Vesuvius in 79 A.D. This set of LES ANTIQUITÉS D'HERCULANUM... was given by Thomas Jefferson to his young protege, the painter John Trumbull. Jefferson has inscribed it on the front fly leaf of the first volume, "Th. J. begs Mr. Trumbull will do him the favor to accept this copy of the Herculaneum." Jefferson was instrumental in furthering Trumbull's career at an early stage, and in encouraging him to create his painting of the presentation of the Declaration of Independence. That painting is one of Trumbull's most important and iconic works, and in placing Jefferson at the center of that scene Trumbull helped to cement the Jefferson image in the American mind. Jefferson and Trumbull first met in London in early 1786, when Trumbull was thirty and Jefferson thirteen years his elder. At the time, Trumbull was studying painting under Benjamin West, but was planning to visit Paris to study the artworks available there. Jefferson invited Trumbull to stay with him at his Paris residence, the Hotel de Langeac, and the two quickly became close. In fact, Trumbull joined William S. Smith and Jefferson's secretary, William Short, in the small group of people that Jefferson asked to perform tasks or "commissions" for him. Trumbull lived with Jefferson for five or six weeks at the Hotel de Langeac, and Jefferson encouraged Trumbull in his early historical paintings. Trumbull had brought with him to Paris two of his recent historical paintings, "Death of General Warren at Bunker's Hill" and "Death of General Montgomery at Quebec," which he wanted to arrange to be engraved. It was almost certainly at Jefferson's suggestion and encouragement that Trumbull added the Declaration of Independence to his series of American historical paintings. With Jefferson's assistance and recollection of the event, Trumbull began his painting of the signing of the Declaration of Independence. It was Trumbull's placing of Jefferson at the center of his painting, flanked by John Adams and Benjamin Franklin, that helped cement the centrality of Jefferson's role as author of the Declaration in the public consciousness. Merrill Peterson asserts that "In the panegyrics of the Fourth of July...the popularity of Trumbull's masterpiece of historical portraiture, 'The Signing of the Declaration' - Jefferson's authorship of the American birthright was his certain title to immortality." Jefferson espoused Trumbull's talents, and introduced him to important people in Paris, and Trumbull repaid the favor in consequential ways. Jefferson's biographer Dumas Malone writes that "Jefferson was on the most intimate terms with Trumbull until the very end of his stay in France, and he always associated him in memory with what he called 'our charming coterie in Paris.'" That coterie included Maria Cosway, the beautiful and vivacious young wife of the English portraitist, Richard Cosway. Trumbull had already met the Cosways, and introduced them to Jefferson in Paris in August, 1786 at the Halle aux Bleds marketplace. The widowed Jefferson became enraptured with Maria Cosway, and spent a great deal of time with her between August and October, 1786. Trumbull was often with the pair, touring art galleries, attending concerts, walking around Paris and journeying into the countryside. On October 12, 1786, on the occasion of the Cosways return to England, Jefferson wrote Maria Cosway an anguished letter in which he related a debate between "my head and my heart." It was to Trumbull that Jefferson entrusted the delivery of this confidential and revealing letter. Trumbull was also an intermediary for Jefferson's friendship with Angelica Schuyler Church, Alexander Hamilton's sister-in-law. Mrs. Church and Maria Cosway were good friends, referring to each other as "sisters." Jefferson, in fact, helped Mrs. Church secure a volume of the HERCULANUM in September, 1788 (see Jefferson letter of September 21, 1788, in PAPERS OF THOMAS JEFFERSON, vol. 13, pp.623- 624). It is possible the gift of this set to Trumbull took place at the same time. The friendship between Jefferson and Trumbull continued after Trumbull left Paris for London and the United States. In 1788, Jefferson commissioned from Trumbull a canvas containing lifesize busts of Francis Bacon, John Locke, and Isaac Newton, who Jefferson considered as "the three greatest men that have ever lived." Also in 1788, Trumbull painted a portrait of Jefferson, and would later make copies of that portrait for Maria Cosway, Angelica Church, and Jefferson's eldest daughter, Martha. In 1789, anticipating that William Short was about to move on to other endeavors, Jefferson offered John Trumbull the position of his personal secretary, and offer that Trumbull declined. Some time after that Jefferson recommended Trumbull for the position of American Minister to the Barbary states, a post that Trumbull also declined. In 1793, Jefferson and Trumbull (a Federalist and a New England Congregationalist), had a falling out over questions of politics and religious faith, issues that came to a head at a dinner Jefferson hosted that also included the Virginia politician William Branch Giles. Trumbull and Giles already had bad blood between them, and when Jefferson seemingly took Giles's side Trumbull recalled that "from this time my acquaintance with Mr. Jefferson became cold and distant." Jefferson's gift to Trumbull of this set of Maréchal's ANTIQUITÉS D'HERCULANUM... is significant on several levels. Excavations at Herculaneum, destroyed by an eruption of Mount Vesuvius in 79 A.D., had begun in 1738. The publication of illustrated books such as Maréchal's, showing the antiquities preserved and discovered at Herculaneum, had an important effect on the growing popularity of Neoclassical styles and themes in contemporary European and American art. 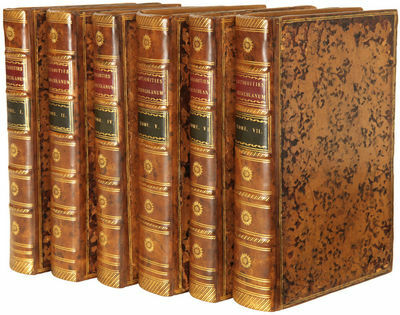 Jefferson himself owned a set of Maréchal's work (although it was not among the works sold to the Library of Congress; it appears in the 1828 sale catalogue of his retained library), and he not only gave this set to Trumbull but ordered a set for the library at the University of Virginia as well. And as mentioned, Jefferson also assisted in securing a volume of the set for Angelica Church in 1788. Jefferson himself was very influenced by classical styles, as evidenced in his architectural designs for Monticello and the University of Virginia. John Trumbull was also greatly influenced by classical art, and was a central figure in the Neoclassical revival in America. This work would have been very important in the development of his artistic style. The first five volumes in Maréchal's work (i.e. volumes I, II, IIII, and V in the present set) are devoted to painting, and volumes VI and VII are concerned with bronzes. An outstanding association copy, uniting Thomas Jefferson with one of his most talented proteges, John Trumbull, whose painting of Jefferson presenting the Declaration of Independence on July 4, 1776 did so much to establish Jefferson in the pantheon of America's Founding Fathers. [Exeter, 1781. Some creasing. Small hole, with loss to two words. Very minor foxing. Contemporary ink inscription on verso: "March & April 1781 No. 2." Overall very good. 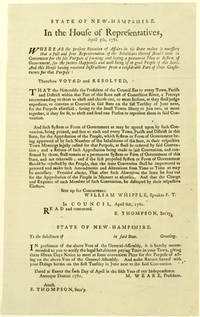 New Hampshire broadside, announcing an important constitutional convention. In January 1776, New Hampshire became the first of the thirteen colonies to adopt a constitution and create an independent commonwealth government. The 1776 constitution, however, had not been submitted to the people, and it severely limited the ability of most New Hampshire citizens to participate in the selection of their representatives. The present broadside, implicitly noting this problem, calls for the different towns and districts of the state to choose delegates to convene for the drafting of a new constitution. Numerous conflicts and amendments caused the convention to last for over two years, and the constitution was rejected by the people of the state four times before it was finally approved and put into effect in June 1784. The constitution itself greatly expanded manhood suffrage in the state, included an extensive bill of rights, and is notable as one of the earliest documents establishing the republican form of government adopted by the Framers in Philadelphia in 1787. NAIP records three copies. Das Lob der Narrheit, aus dem Lateinischen (von W. G. Becker). Paris, 1781. Contemporary mottled calf, rebacked with most of original backstrip retained, gilt French coat of arms on boards. Boards rubbed and edgeworn. Bookplate of the Earls of Annandale on front free endpaper. Map backed on cloth. Early ownership signature of "Savary" on titlepage, ink notations on one page of text, armorial plate on front free endpaper with an apparent signature erased. Good. Lacks the map, "Carte de Environs du Fort Pitt et de la Nouvelle Province Indiana Dediee a M. Franklin." The first French edition. "Hutchins' work is one of the most valuable sources on the West during the British period. It is of particular interest for the Illinois country. The appended journal by Captain Kennedy describes his voyage up the Illinois River to its headwaters during July and August of 1773" - Streeter (1778 edition). Hutchins was the most accomplished geographer in America at the time, and his exact description of the regions west of the Alleghenies were the best available at the time of the Revolution. He produced a large map of the West at the same time he published this book, although they were not issued together. This French edition has an intriguing story behind it that warrants further research. It differs from the English edition in combining the two small maps of Kaskaskia and the Falls of the Ohio on a single sheet (present in this copy) and adds a larger folding map, "Carte de Environs du Fort Pitt et de la Nouvelle Province Indiana Dediee a M. Franklin" (lacking from this copy). 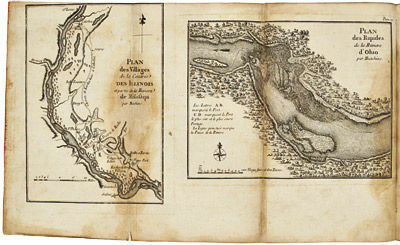 On close examination, this proves to be a 1:1 reproduction, with captions in French, of a segment of the large map issued in London in 1778, about one-twelfth of the whole map, from the right center of the big map. Geographically this shows much of the present state of West Virginia, southwest Pennsylvania, and southeast Ohio. The French edition also differs from the British in containing an appendix with translations of all of the longer captions from the big British map of 1778. This copy bears the inscription on the titlepage: "Savary donné par [?] Oer. Consul." This is likely Jean Savary de Valcoulon, who made the acquaintance of Albert Gallatin when Gallatin was teaching at Harvard. "In his native Lyons, Savary had already failed in business and had achieved a reputation as an ardent supporter of the principles of the American Revolution. He had found a way to serve both his economic and his idealistic needs by becoming an agent of René Rapicault, a Frenchman who had advanced money and supplies to the State of Virginia during the Revolution War. Unfortunately for his mission, Savary was unable to speak or write English, and he clung like ivy to the Harvard tutor who was becoming fairly fluent in it. Savary spoke no English and proposed that Gallatin accompany him on a business trip as interpreter, and Gallatin eagerly accepted....they bought from several sources warrants for 120,000 acres of land in the Ohio River valley....One-quarter of this was to belong to Gallatin, with Savary obligingly advancing the money for the entire purchase" - Walters. Savary increased Gallatin's share to one-half, and in 1784 the pair embarked on an expedition to the Ohio and the Great Kanawha, the first time they were to cross the Alleghenies. The expedition ended disastrously. (See Walters for a lengthy account of the association betwen Savary and Gallatin.) In 1794, Gallatin sold the entire amount of claims which he held with Savary, without warranty of title, to Robert Morris, then a major speculator in western lands, for $4000 in Pennsylvania currency. Gallatin went on to become Secretary of the Treasury. Hutchins' DESCRIPTION TOPOGRAPHIQUE DE LA VIRGINIE... would have been of the greatest interest to Savary. How did this English book come to be translated and published, with these differences, in France in 1781, while England, France, and the United States were at war? The answer lies in the peculiar story of Hutchins. Although a native of America who grew up on the Pennsylvania frontier, Hutchins obtained a regular British army commission and saw extensive service during the French and Indian War. When the Revolution broke out he was in England, preparing his map and the accompanying TOPOGRAPHICAL DESCRIPTION.... In 1779 he resigned his commission rather than be sent to America to fight his countrymen, and later that year he was arrested for treasonable correspondence with Americans in France. At that time Franklin denied he knew Hutchins, a patent falsehood, since they had been well acquainted for years. After he was bailed out by powerful friends in England, Hutchins fled to France and made a bee-line for Franklin. He was in Paris in late 1780 when this translation was licensed on Nov. 15, and shortly thereafter left for America to become the "geographer to the United States by appointment to Congress." The lands that Hutchins chose to highlight happened to center on the land claimed by the Indiana Company, in which both Franklin and the French minister, Vergennes, had financial stakes. It seems clear that, far from not knowing each other, Hutchins and Franklin were not only in correspondence when the former was arrested, but they shared mutual land promotional interests which both the English and French editions of this book aided to some degree. Undoubtedly, much more remains to be discovered about this relationship and its role in promoting American lands in France. Obras del venerable P. Maestro Fr. Luis de Granada, de la Orden de Santo Domingo. Con la "Vida y virtudes del venerable varon el Padre Maestro Fr. Luis de Granada", por el licenciado Luis Muñoz. [19 TOMOS, COMPLETO]. Cours de construction des ouvrages qui établissent la navigation des rivières et de canaux, professé a l'école des ponts et chausses de 1832 à 1841.Paris, Carillan-Goeury & Dalmont (printed by Fain & Thunot), 1841. 2 volumes. Royal 4to (text) & Imperial 4to (plates). With 36 double page plates. Dark green half calf, Spanish marbled paper sides, blue sprinkled edges. Poggendorff II, col. 154; WorldCat (9 copies). A work on managing water flow and levels in rivers and canals, in two volumes, the first being a text volume and the second consisting of 36 double page plates. The text volume is divided into two parts, devoted respectively to rivers and canals. With chapters on the construction of locks, dikes, dams, tunnels, aqueducts, and bridges. By the French engineer Charles Joseph Minard (1781-1870). The text volume includes a 27-page explanation of the plates, an 8-page index and a list of errata. Re-backed with original backstrip. A very good copy, with only the text volume slightly foxed throughout. On managing water flow in rivers and canals. "In Council" [Richmond, Virginia], 1781. 1-1/2 pp. pen and ink in a secretarial hand on folded sheet of laid paper with integral address leaf. Folio (14-1/2 x 9 in.). Minor loss to text at lower edge, creased from prior folding. 1-1/2 pp. pen and ink in a secretarial hand on folded sheet of laid paper with integral address leaf. Folio (14-1/2 x 9 in.). A wartime letter to Lafayette from Jefferson as Governor of Virginia, regarding tools and men necessary for operations against Benedict Arnold at Portsmouth, recruitment of militia, condition of cavalry, and sending a letter (not present) to General Greene. Lafayette is not named in the letter, but his name is docketed at the head of Jefferson's retained copy (now at the Library of Virginia). The turncoat Benedict Arnold had begun openly serving the British side at the end of 1780 with raids on the Chesapeake from his base in Portsmouth. "Arnold's force routed the Virginia militia, burned ships, munitions, and tobacco, and forced Governor Thomas Jefferson into humiliating flight" (ODNB). 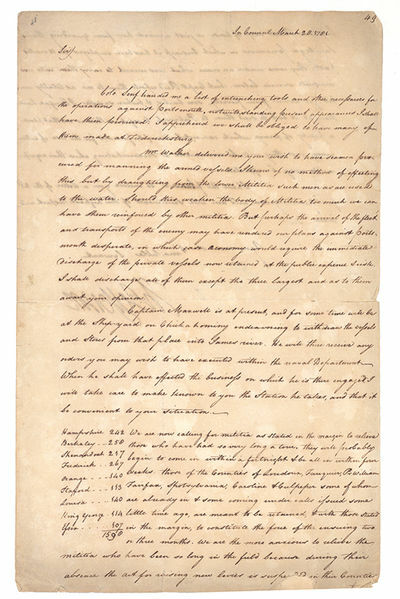 As this letter makes clear, Jefferson took an active and detailed interest in planning the resistance to Arnold's raids. Lafayette was ultimatley successful in defending Richmond from a British attack, but Jefferson suffered further humilation, having been chased from Richmond to Monticello by Cornwallis. After the British defeat at Yorktown, Jefferson faced an inquiry from the House of Delegates over his conduct during Arnold's invasion of Virginia. He was never officially censured, though his single term as Governor of Virginia did, for a time, sour Jefferson on ever holding public office again. The letter reads, in part: "Colo. Senf handed me a list of entrenching tools and other necessaries for the operations against Portsmouth ... Mr. Walker delivered me your wish to have seamen procured for manning the armed vessels ... But perhaps the arrival of the fleet and transports of the enemy may have rendered our plans against Portsmouth desperate ... Captain Maxwell is at present, and for some time will be at the Ship-yard on Chickahominy endeavoring to withdraw the vessels and Stores from that place into James river. He will there receive any orders you may wish to have executed within the naval Department ... We are now calling for militia as Stated in the margin [here militia numbers from various counties are tallied, totaling 1,590 men] to relieve those who have had so very long a tour. They will probably begin to come in within a fortnight and be all in within four weeks ... Captain Reid's troop of horse is just arrived here from guarding the Saratoga prisoners in which business it has been employed for 18 months past. They came under an order which was meant to carry them into immediate service below, but Capt. Reid reports them to me as totally unfit for service from poverty, sore backs, and broken saddles ... I have the pleasure to inclose you a Letter of the 23d. from General Greene ..."
The Genera Insectorum of Linnaeus, exemplified by various specimens of English Insects drawn from nature./ Les Genres des Insectes de Linné; constatés par divers échantillons d'Insects d'Angleterre copiés d'après nature. Leipzig, im Schwickertschen Verlage, 1781-83. 3 parts (bound in one). 8vo (190 x115mm). pp. 10, 98, (4), with 1 engraved title vignette and 6 engraved handcoloured plates; pp. viii, 102, (2), with 7 handcoloured engraved plates; pp. (6), 138, with 6 handcoloured engraved plates. Contemporary half calf, spine with gilt ornaments and lettering. August Wilhelm Knoch (1742-1818) was professor of physics. He published 2 entomological works, the present one and 'Neue Beyträge zur Insectenkunde' Leipzig 1801. The excellent plates were engraved by H.A. Schmidt after drawings by the author and show mainly butterflies. Some slight waterstaining. Very scarce.//Nissen ZBI, 2225. [Japan 1781, - n.p.] 19th century Meiji reprint edition, 3 volset, black stitched wrappers., 48 b.w. woodcuts, 16+16+16p.,very clean copy, 18 x 25 cm. SCARCE Color scans available for this book on request. 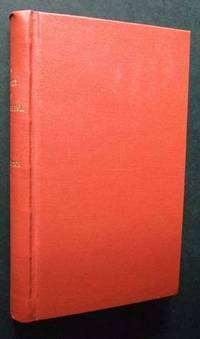 Description content 2015Copyright Rare Oriental Books Co.
Collection complette des Oeuvres de M. de Voltaire - Band 1-57, ohne Band 36. Aus der Bibliothek von dem Wagner Mäzen Otto Wesendonck. Edition complete des oeuvres de Voltaire Tome 1-57, sans Tome 36, issue de la bibliotheque du mecene de Wagner Otto Wesendonck, belle edition en reliure demi-cuir. à Paris: chez Belin., 1781. Fine. chez Belin., à Paris 1781, in 8 (12x20cm), viij, 326pp., relié. - First edition of the translation by Ramond Carbonnières annotated and expanded its observations. Full Sheepskin brown speckled time. Smooth back florets and nets. Roulette border on covers. Part of title in red morocco. Caps threadbare. Corners bumped. Coxe effected 2 trips (1766 and 1779) through the Swiss cantons, his letters are full of picturesque descriptions, plus remarks of the translator who also made a trip to Switzerland. A second volume appeared the following year. --- Please note that the translation in english is done automatically, we apologize if the formulas are inaccurate. Contact us for any information! - [FRENCH VERSION FOLLOWS] Edition originale de la traduction par Ramond de Carbonnières, annotée et augmentée de ses observations. Reliure en pleine basane d'époque brune mouchetée. Dos lisse à fleurons et filets. Roulette d'encadrement sur les plats. Pièce de titre en maroquin rouge. Coiffes élimées. Coins émoussés. Coxe effectua 2 voyages (en 1766 et 1779) à travers les cantons suisses, ses lettres fourmillent de descriptions pittoresques, augmentées des remarques du traducteur qui fit également un voyage en Suisse. Un second volume paraîtra l'année suivante. NB : Cet ouvrage est disponible à la librairie sur demande sous 48 heures. London. & London: Fleet-Street. & London: B White. & B White & Son. & Robert Faulder, 1781 3 vols in 1. In full c 1790 basket weave calf, decorative gilt edge tooling, corners and edges bumped and worn. Spine, faded, gilt tooling and titles. Internally, red marbled endpapers, Genera, engraved titlepage, , (1), (ii-xxv), , , 2-68 pp, 16 pls. Oiseaux, 1st Eng ed, eng index titlepage, 9 only, , , (iv-vii), , , 2-122 pp,  adverts, , 1 pl. Zoology, 2nd ed, eng tp, (viii), , 3-27, , 31-161 pp, ,  addendum, 17 pls, Includes ?An essay on India, .. Translated from the Latin of John Reinhold Forster, by John Aikin, M.D.. Text block edges gilt, armorial bookplate to fpd, crack to top inch of each joint, browning and offsetting. (ESTC T862. Graesse 191.Alibone 1554. ESTC T856 ). Pennant, naturalist, traveller, and writer. See ODNB. Erede di Alberto Pazzoni 1781 - 1782 Notizie storiche della città di Mantova...dalla fondazione di Mantova sino all' anno di Cristo 989 (vol. 1°) e 1183 (vol. 2°). Visi, Giovanni Battista. Mantova, Erede di Alberto Pazzoni, 1781 - 82. 2 volumi in - 4° grande, m. pergamena con angoli ottocentesca. viii, 380 pp. con 2 carte (geografica e topografica) ripiegate f.t. ; viii, 402 pp. con una tavola incisa in rame f.t. raffigurante la contessa Matilde a cavallo. Le pp. 53 - 56 sono posposte. Bell' esemplare di opera rara rimasta incompiuta per la morte dell' autore. Manca al Lozzi. Bibl. Platneriana, p. 193. South Sea whale fishery. A representation of the ships Amelia Wilson & Castor off the Island of Bouro - with their boats & crew in the various process of fishing, shewing the manner the spermacetti whales are caught, also the method of cutting them into the ship, & boiling the oil upon deck.London, W.J. Huggins, January 1, 1825. Aquatint (plate size: 44 x 56.5 cm), printed on unwatermarked wove paper (50.5 x 61.5 cm). Ingalls, Lothrop collection 104; Kendall Whaling Museum prints 188. Second issue(?) of a striking aquatint by Thomas Sutherland after a painting by the celebrated marine painter William John Huggins (1781-1845), original a sailor by trade. The spectacular scene shows the British whalers Amelia Wilson and Castor off Buru, Indonesia, with a dying sperm whale smashing a whale boat, crew "cutting in" blubber alongside one of the ships, and several whale boats giving chase.An earlier (and slightly smaller) version was published as South Sea Whale Fishery. The present print, with a longer title, shows the same scene "but differs in size and in execution of the sky and other details" (Ingalis). Ingalis suggests that "there may have been a third and perhaps even a fourth plate engraved of the same scene ...". In very good condition, with some traces of tape at the foot. London: F. Newbery, 1781. The leaf D4 cancelled as usual and replaced with four unsigned leaves; map neatly reinforced at the back of folds and with a short tear repaired, a trace of worming in the last 35 leaves, affecting some letters; a very good copy in contemporary calf, well rebacked retaining the worn original spine panel and crimson label.. Octavo, with a folding map and five engraved plates (one folding), restored contemporary calf. The first full account in English of Cook's third voyage: this is one of the most significant of the surreptitious accounts of Cook's voyages - the unauthorised accounts published anonymously to avoid repercussions from the Admiralty, who had embargoed the publication of private narratives before the appearance of the official version. 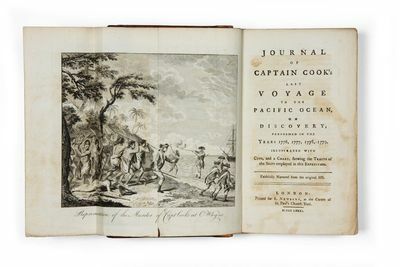 In this example, Rickman scooped the official version by a full three years.Though published anonymously, this scarce and important account of the voyage was conclusively shown by Judge Howay (Zimmermann's Captain Cook, Toronto, 1930) to have been the work of John Rickman, a lieutenant on the voyage. His description of the voyage, as well as predating the official account, differs from it in many respects - particularly regarding the death of Cook, for which this is a prime source.This is therefore the first full authentic description of Hawaii to appear in English, and the engraved frontispiece "Representation of the Murder of Capt. Cooke at O-Why-ee" is in fact the first representation of Hawaii in a printed book.David Forbes identifies a number of variant states of the book, without assigning priority. This is an example of his state "B" with various identifying misprints and pagination errors. Many editions and versions of the book followed in later years, attesting to its popularity and importance. London: Printed by J. Nichols, 1781. First Edition. Cloth. Good. First Edition. Large 4to., [iv] + [ii]-viii + -468 + [469-470] + 471-472 + 471*-477* + blank + 473-557 +  (binder's directions and errata); modern library buckram gilt; binding lightly scuffed; library stamp to top edge; personal bookplate (Archie W Shiels) and ex library institutional stamps to front pastedown; new endpapers; inserted modern frontispiece on coated photo paper; title page with holograph annotations; "Contents" page marked with colored pencil; scattered foxing throughout; some pages brittle due to paper quality; library pockets and electronic tags at rear pastedown; an imperfect, ex library copy. Lacking the portrait of Mozart (at age seven) and map of the Ohthere's Voyage. The Map of the Northwest coast of America and portrait of Sir John Wynne Baronet are both present. Cloth. This copy owned by Vincent Novello, and presented by him to the Musical Antiquarian Society July 8, 1845. "[Novello] was an original member of the Philharmonic Society, of the Classical Harmonists and of the Choral Harmonists, officiating frequently as conductor. In 1849 he went to live at Nice, where he died. Many of his compositions were sacred music, much of which was very popular. His great contribution, however, together with Christian Ignatius Latrobe, lay in the introduction to England of unknown compositions by the great masters, such as the Masses of Haydn and Mozart, the works of Palestrina, the treasures of the Fitzwilliam Museum, and innumerable, now well known great compositions." (wikipedia) Much on travel to the Northwest and polar regions, natural history, the Linnean system and other subjects, including a report on Mozart , a "very remarkable young musician." 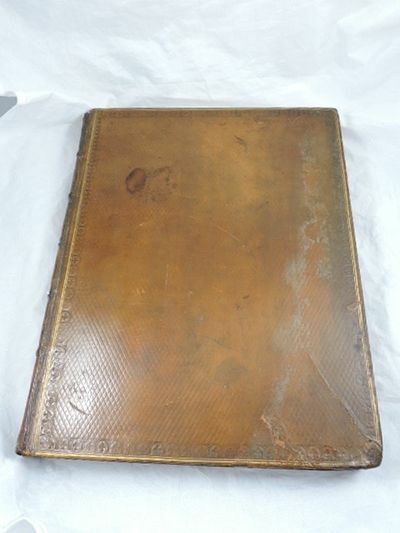 Among Americana collectors the book is notable for publishing the "journal of Maurelle, pilot with the fleet commanded by Don Juan de la Bodega, while exploring the coast northward of California in 1775; this portion was also issued in separate form." Streeter mentions the account to be the only contemporary source in English of this important voyage. See Howes B177 and Streeter Sale IV, 2445. Also: Sabin 3628. Milan: Giuseppe Galeazzi,, 1781. Two parts in one volume, folio (350 x 240 mm), pp. [64, including 2 blank leaves]; . Nineteenth-century half tree sheep aand marbled boards, spine lettered gilt, sprinkled edges. Some leaves trimmed close and folded in to protect the text; a very good copy. Third, expanded and corrected edition, scarce. This would appear to be a later printing of Vergani's Esempare per la pratica della scrittura doppia economica, originally published in 1741, with a second edition in 1774, here published with an abbreviated title.